Socket the Hedgeduck: v0.3/SHC16 release! 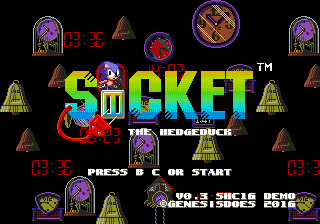 After a little more than a month of work, a v0.3 demo build of Socket the Hedgeduck has been released, as both an IPS patch and on the Sega Mega Drive & Genesis Classics Collection on Steam Workshop! You can download the patch or subscribe to the mod page under the "releases" section on the updated project page. Among many other changes, Antiquity Zone and High Speed Zone 5 have been added and a lot of nitpicky polishing and bug fixes were made. In related news, over last week and last weekend a lot of legitimate Steam Workshop mods for the SMD&GCC were falsely flagged and taken down, Socket the Hedgeduck was one of them. After submitting a Steam Support ticket explaining the situation, I was luckily able to get the illegitimate ban lifted and reinstate the mod. Socket the Hedgeduck has also been submitted to the Sonic Hacking Contest 2016, which will be taking place on November 7th, where it will be privately and publicly judged to compete for some of the Sonic community's hacking trophies! Come join for the live streams and festivities during that week!